Ivaska, Laura, and Outi Paloposki. 2018. “Attitudes towards indirect translation in Finland and translators’ strategies: compilative and collaborative translation.” Translation Studies 11 (1): 33–46. Available here and here. Ivaska, Laura. 2018. “Learning how to do Stylometry with style at the European Summer University in Digital Humanities 2018 in Leipzig.” Blog post in the CLARIN-D blog published 25 September 2018. Available here. Ivaska, Laura. 2018. 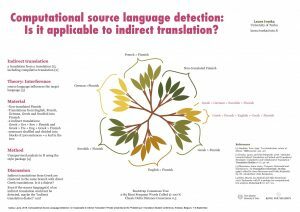 “Computational Source Language Detection: Is It Applicable to Indirect Translation?” Poster presented at Publishing in Translation Studies. Antwerp, Belgium. 7–8 September. Available here. Ivaska, Laura. 2018. 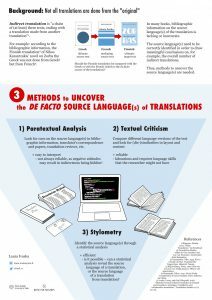 “Three Methods to Uncover the de facto source language(s) of translations.” Poster presented at the “Culture and Technology” – The European Summer University in Digital Humanities, Leipzig, Germany, 17–27 July. Available here. Ivaska, Laura. 2016. 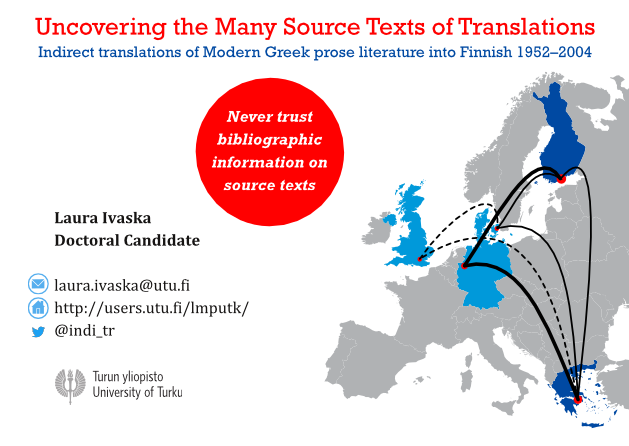 “Uncovering the Many Source Texts of Indirect Translations: Indirect Translations of Modern Greek Prose Literature into Finnish 1952–2004.” Poster presented at the 8th European Society for Translation Studies Congress, Aarhus, Denmark, 15–17 September. Available here. Ivaska, Laura. 2016. “Kreetalla kääntäjä Kyllikki Villan jalanjäljissä.” Filellinas 80, 13–14. Available here in Finnish and here in English translation. 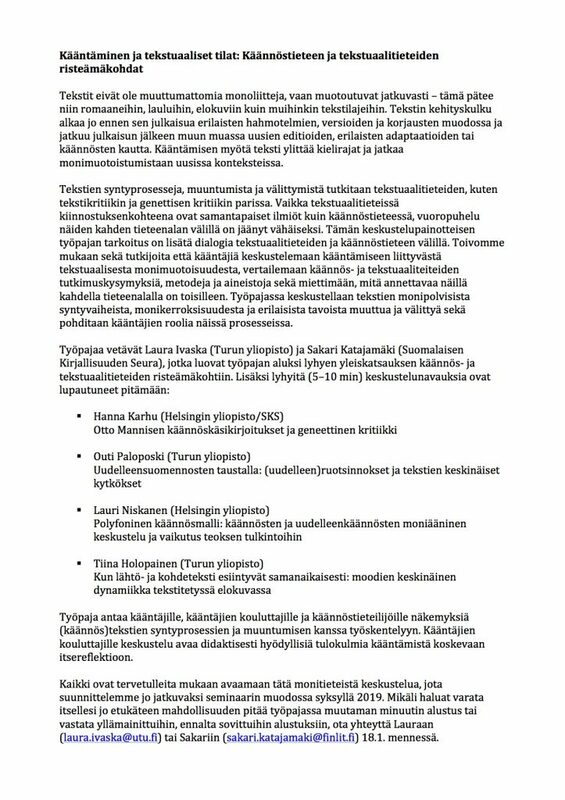 Kääntäminen ja tekstuaaliset tilat: Käännöstieteen ja tekstuaalitieteiden risteämäkohdat (with Sakari Katajamäki). Workshop led at the XVII Symposium for Translation and Interpreting Studies (KäTu 2019). Tampere, Finland. 12–13 April 2019. Doing Poster Presentations: Report on a survey (& tips) (with Ester Torres-Simón). Poster presented at the XVII Symposium for Translation and Interpreting Studies (KäTu 2019). Tampere, Finland. 12–13 April 2019. 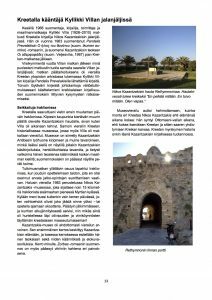 Välkielen kautta kääntäminen: Esimerkkinä nykykreikasta 1952–2004 suomennettu kaunokirjallisuus. 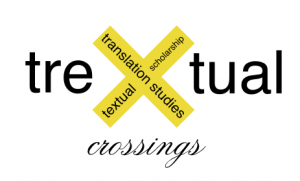 XVII Symposium for Translation and Interpreting Studies (KäTu 2019). Tampere, Finland. 12–13 April 2019. How to make a poster that effectively communicates your research? Invited workshop led at the Department of Interpreting and Translation, Alma Mater Studiorum Università di Bologna, campus di Forlì. 6 February 2019. The Multiple Voices in Translations: Translator as a (Scholarly) Editor. The 15th annual conference of the European Society for Textual Scholarship. Prague, Czech Republic. 15–17 November 2018. Ma un computer riesce a identificare la lingua di partenza di una traduzione? Invited talk at the Department of Finnish, Università degli studi di Napoli “L’Orientale”. Naples, Italy. 24 October 2018. Computational Source Language Detection: Is It Applicable to Indirect Translation? Poster presented at Publishing in Translation Studies. Antwerp, Belgium. 7–8 September 2018. Three Methods to Uncover the de facto source language(s) of translations. Poster presented at the “Culture and Technology” – The European Summer University in Digital Humanities. Leipzig, Germany. 17–27 July 2018. Click the image or here to download the poster. Indirect Translation: A Remedy for Translating Languages of Limited Diffusion? Translation Research – Translator Training Conference. Budapest, Hungary. 24–26 May 2018. Sui diversi modi di tradurre (al finladese): Quando la prassi non corrisponde alla teoria. Invited talk at the Department of Finnish, Università degli studi di Napoli “L’Orientale”. Naples, Italy. 26 April 2018. Rethinking the concept of source text: The case of compilative translation. 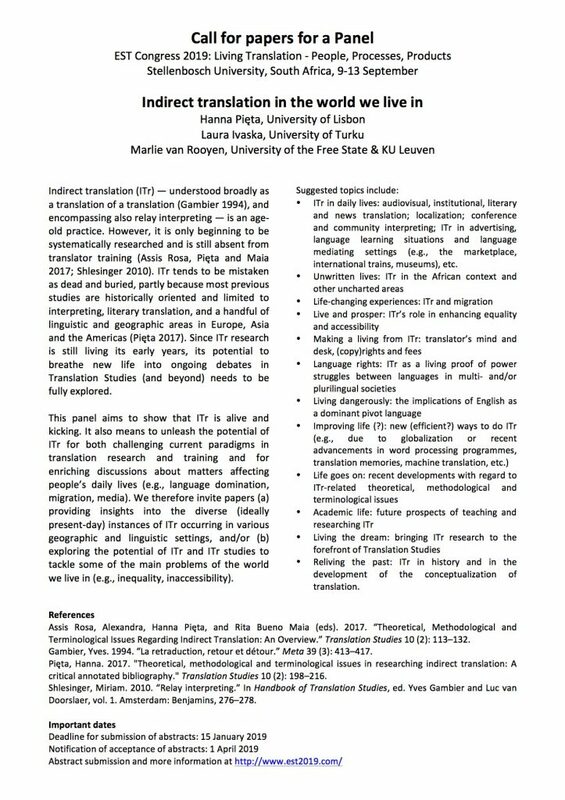 XVI Symposium for Translation and Interpreting Studies (KäTu 2018). Turku, Finland. 13–14 April 2018. Translators as Editors. The 14th annual conference of the European Society for Textual Scholarship. Alcalá de Henares, Spain. 23–24 November 2017. Uncovering the Many Source Texts of Translations (with the Help of Genetic Criticism). Unexpected Intersections: Translation Studies and Genetic Criticism. Lisbon, Portugal. 8–9 November 2017. 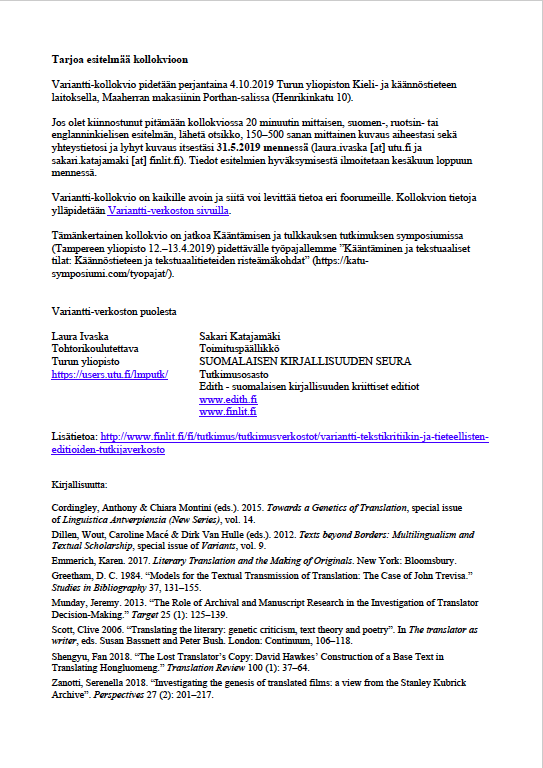 Indirect Translations of Modern Greek Literature into Finnish (1952–2004): A Pilot Study. CETRA Summer School of Translation Studies. Antwerp, Belgium, 28 August–8 September 2017. The role of Finnish Literature Exchange (FILI) in Finnish Literature Exporting. Workshop on Translation History and Literary Transfer, CETRA Summer School of Translation Studies. Antwerp, Belgium, 28 August–8 September 2017. 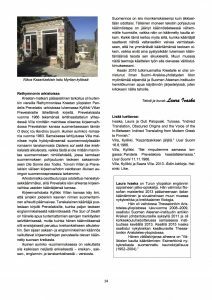 Uncovering the Many Source Texts of Indirect Translations: Indirect Translations of Modern Greek Prose Literature into Finnish 1952–2004. Poster presented at the 8th European Society for Translation Studies Congress. Aarhus, Denmark, 15–17 September 2016. Click the image or here to download the poster. Indirect Translation: Modern Greek Prose Literature Translated into Finnish 1952–2004. Translation Studies Research Seminar. University of Turku, Finland. 8 September 2016. Obscured Origins of Translations: Indirectness and the Use of Several Source Texts. The 24th Annual Conference of the Society for the History of Authorship, Reading and Publishing. Paris, France. 18–22 July 2016. Indirect Translation: Stigmatized Savior? The 2nd Graduate Student Conference in Translation Studies. Ottawa, Canada. 13–14 November 2015. Indirect Translation (The Beginnings of a PhD Project). Emuni Agricola International Translation Studies Doctoral and Teacher Training Summer School. Turku, Finland. 1–12 June, 2015. I am doing my PhD in the Doctoral Programme in Languages and Translation Studies (Utuling) at the University of Turku (at the Department of English). The Utuling doctoral programme is a member of the International Doctorate in Translation Studies (ID-TS) and Langnet, a network for Finnish doctoral programmes in language studies. I am also a member of the international IndirecTrans Network, which is dedicated to bringing together research on indirect translation. Vedämme Sakari Katajamäen kanssa KäTu2019-symposiumissa työpajan “Kääntäminen ja tekstuaaliset tilat: Käännöstieteen ja tekstuaalitieteiden risteämäkohdat.” Voit ilmoittautua jo nyt mukaan! Abstract submission is now open for the panel “Indirect translation in the world we live in” taking place at the EST Congress 2019, “Living Translation – People, Processes, Products,” to be held at Stellenbosch University, South Africa, 9-13 September. 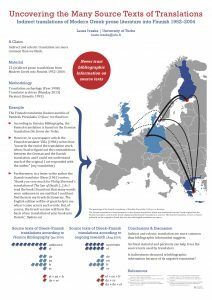 I won the Best Poster Award at the The 8th European Society for Translation Studies Congress held in Aarhus, Denmark, on 15–17 September 2016 with my poster titled Uncovering the Many Source Texts of Translations: Indirect translations of Modern Greek prose literature into Finnish 1952–2004. *The map of Europe (above and on the poster) is a derivative of https://commons.wikimedia.org/wiki/File:Blank_map_of_ Europe_cropped_(blue).svg by NikNaks, used under Creative Commons BY-SA 4.0. The map is licensed under CC BY-SA 4.0.